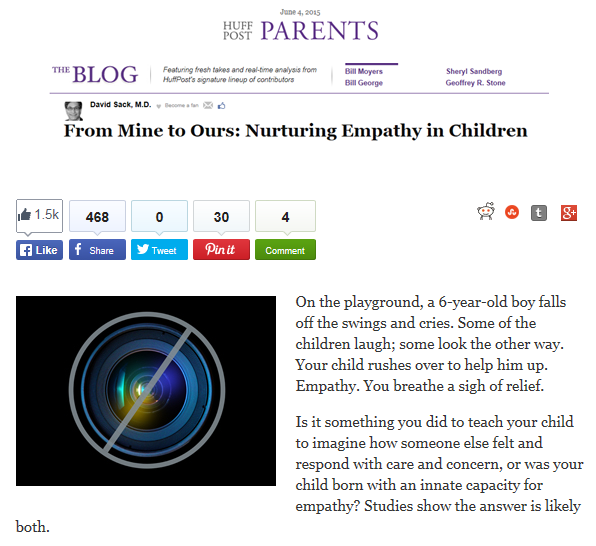 This is a good article on how to foster empathy among children, a topic I discuss in my book, Do the KIND Thing. Empathic children are aware of their own feelings and individuality; are able to relate to common feelings while also distinguishing their own emotions from the feelings of others; can imagine how others might feel in a given situation and respond in a way they imagine might be comforting to that person. Studies show children are born equipped to be empathic, but these skills take time and practice to develop. Some studies suggest that the development of empathy has its roots in infancy, though it takes many years for this skill to mature. Babies as young as 6 months old begin using social referencing, looking to the reactions of a parent or caretaker to gauge the safety of a situation or new person. Research suggests that children as young as 14 months offer to help an adult who is struggling to reach something. As children near age 2, they begin to realize that they are a separate person with their own thoughts and ideas. Toddlers show early signs of empathy, for example, by offering a blanket to a parent who is in distress. In most cases, the toddler will offer assistance based on the things they have found comforting, such as a favorite toy or bottle, but the empathic intention is there. Around age 4, children begin to associate their emotions with the feelings of others. By 6 or 7, a child can take another person’s perspective and offer appropriate help when they are suffering. It takes longer, some theorize as late as adolescence, for a child to begin to empathize on a broader scale; for example, with societal issues such as homelessness or discrimination. Empathy is a skill that experts from many disciplines have deemed important for personal, relationship and career success. People who are empathic tend to have better social interactions, academic performance and accomplishments at work than others. 1. Parent Responsively: Early attachments during infancy lay the groundwork for children to learn how to comfort themselves as well as others. Babies learn empathy when their parents consistently meet their needs. When they are fussy, scared, hungry or uncomfortable, the responsive parent works to understand their feelings and cues and make them feel better. Children who know they can count on a parent or caregiver for emotional support and physical affection are more likely to offer help to others. Studies show that children have a greater capacity for empathy when their own emotional needs are met at home. 2. Validate the Full Range of Emotions: Children need a certain level of self-awareness in order to develop empathy. By using “I” messages (“I feel sad when you throw things”), you model self-awareness. When parents identify and validate how a child is feeling (“You are feeling angry because you wanted to play with that toy. I understand, it’s okay to feel angry, but it’s not okay to throw things.”), the child develops this self-awareness as well as an understanding of the way other children feel. Those who are taught that certain emotions, such as sadness or anger, aren’t acceptable often struggle to understand and express themselves. 3. Give Names to Feelings: Identifying and labeling emotions helps children organize their emotional world. Early on (typically in toddlerhood), children master the basics such as happy and sad, but it is helpful to expand their understanding to feelings of disappointment, frustration, excitement, nervousness, fear and so on. In addition to naming feelings, parents can explicitly talk about the importance of sharing and taking turns.Once the child understands their own feelings, they can understand other people’s feelings and cross-reference them when their actions affect someone else. For instance, if the child felt sad when a toy was taken away, later they have the language to recognize that another child may feel the same way if their toy is taken away. 4. Role Play: Toddlers can learn about empathy through role play. For example, pretend a doll doesn’t want to share with another doll, or a toy hurts another toy’s feelings. Then ask your child how the “wronged” party feels and what solutions might address the problem. When watching television or movies, reading books or looking at photographs or drawings with your child, talk about how the characters might be feeling and what their different perspectives might be. This also helps children read nonverbal cues such as facial expressions and body movements and understand the types of reactions that are acceptable. 5. Point out Similarities and Differences: Studies show it is easier to empathize when we see similarities between ourselves and others (most children share the feeling of sadness or anger when a toy is taken away or unfairness when an injustice takes place on the playground). It is also important to recognize the differences since what makes one person feel better might not help another person. 6. Model Empathy: Explicit teaching can help build empathy, but even more important is being empathic yourself. Parents can model empathy in their interactions with other adults. Share your own empathetic process out loud, for example, by trying to understand the cause of someone else’s rude outburst or hurtful behavior, expressing concern for others, and thinking of ways you might be able to brighten someone else’s day. Parents also model empathy through their parenting style. A parent who stays calm, processes their feelings and offers rational explanations even when their child misbehaves models healthy emotional management. When children get older, they benefit from parents who ask questions about their feelings and listen actively and reflectively. In this way, they learn how to relate to others by practicing at home. By contrast, the parent who spanks, punishes or yells sends the message that these behaviors are acceptable responses to strong emotions. Studies show that over time, spanking and related punishments fail to improve behavior and actually increase aggression in children. Children who are punished for undesirable behavior (or conversely, rewarded with material goods for helping others) do not develop an internal sense of right and wrong; they merely learn to comply. An approach that models compassion and explores how the child’s behaviors affect other people is more effective in the long run. 7. Encourage Reading and Game-Play: It may sound like an unusual way to learn empathy, but studies have shown that reading fiction helps people understand complex social interactions and put themselves in other people’s positions to understand their deepest motivations and desires. Studies also suggest that playing games against others can aid in the development of empathy. Games encourage players to put themselves in their opponent’s shoes to understand their intentions and make strategic guesses about how they’re going to play. 8. Volunteer Work: Older children can benefit immensely from lending a hand to a neighbor in need, volunteering at a homeless shelter or donating time to a community event. These experiences help children put themselves in someone else’s position and also cultivate gratitude. Developing empathy can be a lifelong process. We can’t expect 3-year-olds in to master this skill, nor can we expect children to feel empathy when they are in the midst of overwhelming feelings of their own. What we can expect is an open and ongoing dialogue and to hone our own abilities to model empathy in our daily lives. David Sack, M.D., is board certified in addiction psychiatry and addiction medicine. As CEO of Elements Behavioral Health he oversees a network of addiction treatment centers that include Promises, The Ranch, The Recovery Place, and The Sexual Recovery Institute. Quote of the week: What should you wish for your children?